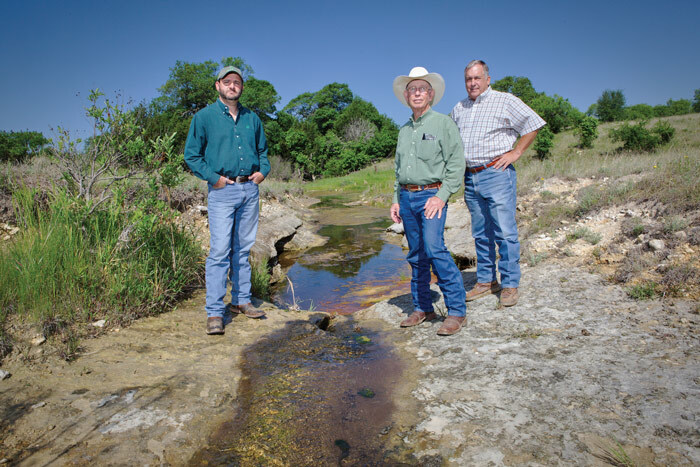 Texas rancher Jule Richmond, center, stands by a spring that feeds into the Pecan Bayou. With him are Cody York of Pecan Bayou SWCD, left, and Johnny Oswald of the Texas Soil and Water Conservation Board. The year 2011 was one of the driest ever for Texas, with a statewide average rainfall of only 14.8 inches. Across the state, rivers, ponds and lakes evaporated to their lowest levels in memory, and losses attributed to the historic drought surpassed $5 billion. The water level in Lake Brownwood, situated in the Colorado River basin in north-central Texas, dropped 17 feet, leaving less than a 15-month supply of water for local residents who depended on it. 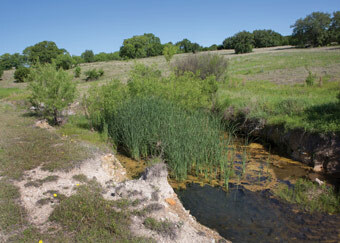 Just miles away in the same county, however, a spring on the Richmond family ranch never stopped trickling. Richmond admits that the spring, which feeds into the Pecan Bayou that creates Lake Brownwood, wasn’t flowing as freely as it is today. Still, its resilience is a testament to his conservation and stewardship practices — particularly the removal of invasive brush to enhance water flow — that allow him to preserve his family’s 134-year-old ranch. Richmond is chairman of the Pecan Bayou Soil and Water Conservation District (SWCD), which oversees and allocates funds for the state’s Water Supply Enhancement Program (WSEP) efforts in Brown County, Texas. Started in 2008, the county’s project is part of the statewide program, which was created to provide grants that meet conservation needs and enhance public water supplies through brush control. A lifelong rancher whose family settled near Blanket, Texas, in 1883, Richmond has practiced conservation on his cattle and goat operation for as long as he remembers. He also recalls his father, Alvin, removing brush from certain pastures back in the 1950s. Since then, landowners have learned about the effects of overgrazing, which can lead to brush overtaking grass and pastureland — detrimental to water supplies and the terrain. “Farmers and ranchers didn’t understand as much about grazing situations and the impact of overgrazing as we do now,” Richmond says. “When they got a rain, it hit the creek, and it was gone; there was no continuous cycle of water. It’s finally making sense to people on how beneficial it is to be wise about the use of water. ” On the Richmonds’ ranch, removing most of the cedar trees, which are notorious water consumers, made a significant impact — even though they left cedars along the creek to help stabilize the banks. 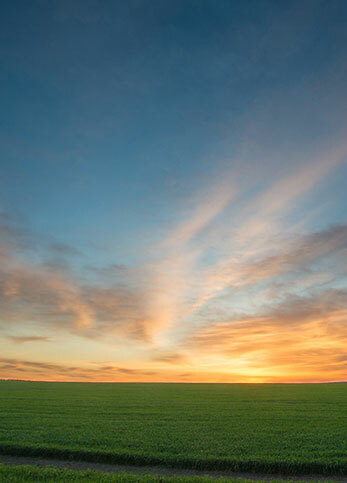 As the local conservation district leader and immediate past president of the Association of Texas Soil and Water Conservation Districts, Richmond advocates proudly for the project, reaching out to other landowners who may benefit on their own land. As of fall 2016, the Pecan Bayou Soil and Water Conservation District project involved 46 landowners who are controlling brush on 6,260 acres. District Outreach Director Phillip Wright says that while the project has provided assistance to landowners in Brown County, their part is just the first step — the real difference will be seen after landowners achieve results that make them want to continue prudent conservation practices on their own. “The Pecan Bayou SWCD provides assistance to hundreds of landowners each year working through their partnership with the NRCS (Natural Resources Conservation Service),” Wright says. For each property enrolled in the program, a resource management plan is developed, which describes the brush control measures that will be implemented, how the land will be maintained and any necessary livestock or wildlife management practices, as well as erosion control measures. Richmond says that his wildlife and aquatic life have done nothing but flourish, enjoying the abundance of a constant water source and a healthy food supply. As a tenured landowner, Richmond knows the importance of a good lender, and for him, that lender is Central Texas Farm Credit. His two sons, Cade and Cody, are also active members of the rural lending cooperative: Cade and his wife, Jessica, represented the association in the Farm Credit Young Leaders Program in 2014, and Cody is a past chairman of the Central Texas Farm Credit Board of Directors. LaNita and Jule Richmond restored his childhood home, pictured here, which was built in 1915 from a Sears, Roebuck and Co. kit. The Richmonds’ goal was to keep the integrity of the house, installing wide baseboards and deep crown molding and using some existing kitchen cabinets, as seen in the living room. 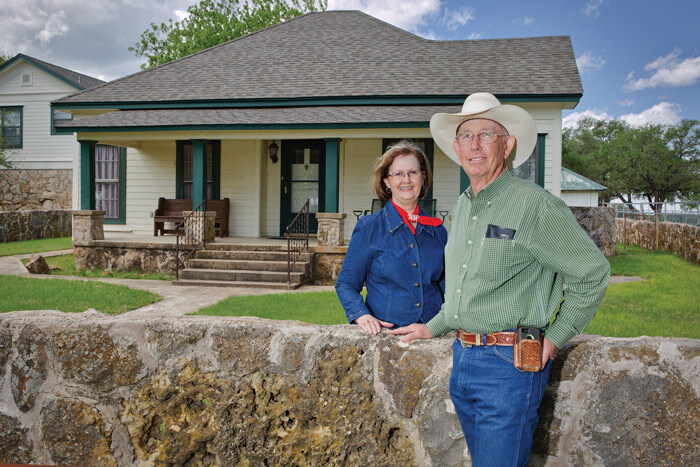 The Richmonds’ desire to preserve the family legacy goes beyond the ranch. 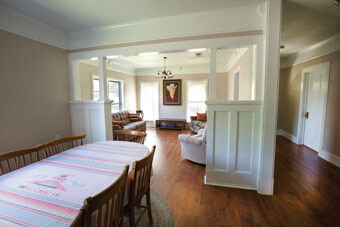 Over the past few years, Jule and his wife, LaNita, have restored his childhood home. Built in 1915 by his father, it was a kit house from Sears, Roebuck and Co., which at the time offered ready-to-assemble houses ordered by mail and shipped by rail. Keeping true to their plan, the couple installed wide baseboards and deep crown molding, which was common during that period. 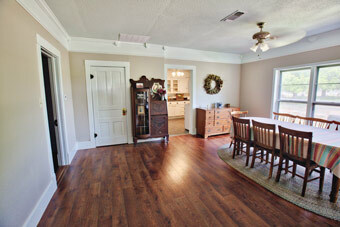 In several rooms, the original longleaf pine flooring has been sanded and refinished. Jule did much of the rewiring and carpentry, while LaNita painted and did the tile work, which included the kitchen floor and backsplash. 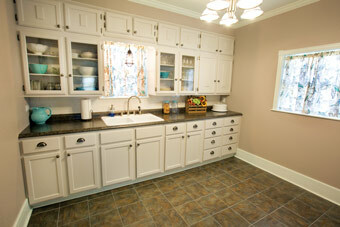 They also reconfigured the small kitchen, adding counter space and using some of the existing cabinets, which Jule’s mother had installed over the years. Today, favorite family recipes adorn the walls of the inviting kitchen, giving guests a glimpse into the Richmond family’s special relationship with the house. “His mother raised three kids in a tiny space with a tiny kitchen and I still don’t know how she did it,” LaNita remarks. Like the land that the family works so hard to preserve, Jule and LaNita know that the ranch house is another piece of their family’s legacy that will be passed down to their three children and eight grandchildren.